Dr. Riddiford is accepting and seeing patients at the address listed on this page, which can be found inside the Huber Health Center. Please enter through the Emergency Room entrance for the most direct access to her office. Kettering Physician Network Primary Care in Huber Heights is proud to welcome Terri Wilkerson Riddiford, MD. 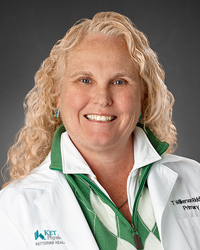 Dr. Riddiford earned her medical degree from Wright State University Boonshoft School of Medicine in Dayton. She completed her residency in family medicine and is board certified in both family medicine and sports medicine. Dr. Riddiford enjoys caring for patients of all ages and uses an integrative approach to health care considering traditional and natural therapies when appropriate and scientifically proven to be beneficial. Dr. Riddiford encourages patient education and is committed to taking personalized time and care with each patient.